Okay, don't panic. But, I have to tell you something important: there are less than 6 weeks left before Christmas! Insanity! It is pure insanity at how quickly the time flies. I love, love, love November and December! I am a total sap for all the traditions surrounding the Thanksgiving and Christmas holidays. But, isn't it crazy how quickly these holidays can morph into chaos inducing madness? These are really fun games, mamas! The creators at I Can Do That! know kids. And they know parents. 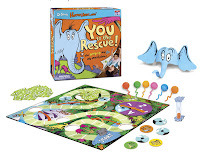 Their Dr. Suess-inspired games get kids up and out of their seats—running, jumping, and following directions. They understand that games for the preschool set need to be simple, engaging, and easy-to-follow. Even better, they seem to have created toys that kids can actually play BY THEMSELVES. Yep, every parents' dream. We also love that these games are intended to build confidence in our kids! If you are a Dr. Suess fan (who isn't? ), you will love the variety of games offered at I Can Do That! We will be giving away 3 Cat in the Hat games, and 3 Horton Hears a Who! games! 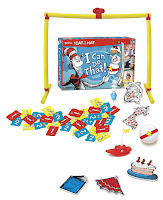 The Cat in the Hat I Can Do That Game - The high-energy game that combines balancing, jumping, sliding, giggling and more to celebrate your child’s “I Can Do That!” attitude! This is a super silly game that helps foster following simple instructions and confidence as kids accomplish a task! And, there is sure to be giggling when you have to do the silly tasks with the "trick-a-ma-stick"! This game has received multiple awards for its greatness! Horton Hears a Who! - Go on a wild adventure to save the Whos! Put on the Horton hat and race around the house to find the clovers where the tiny Whos live. Pick them up with your trunk—then hurry back before time runs out! The player who rescues the most Whos is the winner! This game has won multiple awards. "What is your favorite Dr. Seuss book either from your childhood, or that you enjoy reading with your kids now?" Please shoot us an email in the next two weeks so that we can hook you up! The "I Can Do That" game looks perfect for my preschooler and his little brother (who is currently in the "me do it!" stage). They both also enjoy Horton Hears a Who! and could watch the movie over and over! Thank you for a great giveaway! I did not know either of these games existed - they look wonderful! I LOVED Dr. Seuss when I was little, and my favorite book was probably Hop On Pop. I loved that it taught me "Timbuktu" and "Constantinople". I enjoy reading it now to my son, and whenever I read those words I remember when my parents used to read it to me. I think Green Eggs & Ham was my personal favorite. We read Dr. Seuss EVERY NIGHT over here. My youngest would freak over the Horton game, as she is literally OBSESSED with elephants- doesn't really talk about anything else. I haven't seen that game until now, and we are pretty big on good games. I am not entering in the giveaway - just leaving a comment. My favorite Dr. Seuss book is "Oh the Places You'll Go!" I love the celebration of life's journey - that there will be highs and lows. And, Dr. Suess pretty much gives me a shout out on the last pay when he says, "So... be your name buxbaum or bixby or BRAY mordecai ALI van allen o'shea..."
Our favorite of the I Can Do That Game series right now is the Horton game. My kids get so excited to put on the Horton "helmet" and they are so stinking cute running back to the game with the little who attached to Horton's nose. I cannot imagine a kid that would not LOVE this game! We love the Foot Book! I started having the kids stand and listen...and stamp their feet everytime they heard the word foot or feet! What fun! Its almost become a little dance for them and they listen so attentively for a chance to stamp-stamp-stamp! Thanks! In our house we love to read Are You My Mother? It is such a sweet book and my kids have every page memorized. Another favorite is Red Light, Green Light! My absolute favorite as a child was Green Eggs and Ham! I probably read it a million times. "Oh Baby the Places You'll Go" is near and dear to our hearts right now as we expect our first little one. He responds to his daddy's deep voice and I love the sweet message the book conveys. You can't go wrong with Dr. Seuss! Nothing can beat "Green Eggs & Ham!" Love that book! My favorite Dr. Seuss book is "Fox in Sox". My dad read it to me and my brother all the time when we were little. Sweet, sweet memories. You guys have such great giveaways - thanks! OUr favorite is definitely Green Eggs and Ham... I also love to read Oh The Places You'll Go! My kids loved all the Dr Suess books when they were little but especially Cat In The Hat. Without a doubt, my favorite Dr. Seuss book is "Fox in Socks." My kids' favorite is "Hop on Pop." What a great giveaway -- thanks for the opportunity and I'm checking into I Can Do That! games (sounds like a great gift, too)! I really like "One Fish Two Fish Red Fish Blue Fish." I don't really have a great reason--I just really like it. Also, I watched it in Spanish when I was in high school. if the games are anything like the books, my grandkids will wear them out in a month, they love them so much! Believe it or not,I read my first Dr. Seuss book when I was 28! (for some reason my mom was never a fan) Anyway, I was preparing to move to New York and a friend of mine gave me "oh the places you will go". I remember reading it everywhere(curled up in my bed, during my lunch break, on my way to NY) and wondering how many other fabulous Seuss books I had missed out on. Lucky for me, my girls love Dr. Seuss and I love getting to experience him and his magical world with them. My favourite Dr Seuss book when I was young was Green Eggs and Ham....I always wondered if there really were such things as green eggs and ham in this world somewhere! Thanks so much! My grandchildren and I would have a blast playing one of these games. My favorite was Green Eggs & Ham! i love all his books but one fish two fish is a fave. green eggs and ham is always a winner. Thank you. I loved Horton Hears a Who. It was such a cute book! My favorite right now is Hop On Pop. The twins are really learning to spell/rhyme better after I read this book to them. Such a learning tool and entertainment. My favorite is Green Eggs and Ham. Thanks for the giveaway. My favorite is Marvin K. Mooney Will You Please Go Now. I read it to my granddaughter, but I think I like it better than she does. It's about an unwanted guest-so funny! I always liked marvin k mooney. We don't have a favorite, but we regularly read a number of them as part of our reading routine. My daughter loves them! My favorite is The Gringe Who Stole Christmas. It's a holiday tradition in my family! I also love The Places You Can Go! My three year old is just now starting to get into them, and so far, One Fish Two Fish is a favorite in our house. My kids current favorite Dr. Seuss book is The Foot Book. my favorite was my first, One Fish, Two Fish, Red Fish, Blue Fish. We also really like If I Ran the Zoo. My kid's favorite Seuss book is I "Can Read With My Eyes Shut! ", I have always been fond of "Hop on Pop". We like to read Mr. Brown Can Moo, Can You? the most; I love these classic books! We are currently into Hop on Pop. It's really repetitive and boring but I daughter is a beginner reader and I love to hear her be able to sound out the words. Thanks! Green Eggs and Ham is my fave.I am a subscriber. I loved Fox in Socks, which i could never read through without tripping over my own tongue. It would have to be Green Eggs and Ham. I read that book every night to my grandson! He loved it soooo much! Thanks for a chance to win a great gift! I love the Foot book! It is so fun to read and the kids enjoy it. Of course daughter enjoys the other Dr Seuss books as well since we have a few of them. My son loves for me to read one fish,two fish, red fish, blue fish. Have to admit that I like to read it to him. Horton Hears a Who. LOVE IT!!! The subtext is wonderful. Green Eggs and Ham! I love to read it to my son, he loves to help with the rhyming words. Green Eggs and Ham -- still have that book in memory. Green eggs and Ham!!! I also loved left foot right foot book!!! Green Eggs and Ham for SURE!!!! In our house we could all quote along with Green Eggs & Ham. Please accept my entry. Thank you. I love Green Eggs and Ham. My son loves Green Eggs and Ham which is one I enjoyed as a child. Thanks for the contest! The only Dr. Seuss book we own is "One Fish, Two Fish, Red Fish, Blue Fish." (The rest we check out of the library.) And I have to admit - it's not my favorite, because it's REALLY LONG at bedtime. But it is clever. Green eggs and ham is our fave, but we've just bought Hoton hears a who! We love the I can read with my eyes shut and my son Dtilll loves reading the ABC book as there are so many great words to read. I like to read Dr. Seuss's ABC's to my daughter. It really helps me with articulation, but my daughter really likes to help say the letters now that she recognizes them. We go to the library and look for Dr. Seuss books that we haven't read yet, but it's starting to be slim pickings. The Lunachicks did a song which was a mix of Jan Brady & Green Eggs & Ham. (I am Jan, Jan I am, I like to eat, Green Eggs & Ham). Anyways, thanks very much! I loved "Horton Hatched the Egg." My favorite line...."I meant what I said, I said what I meant, an elephant's faithful, 100%". Thanks! I love Fox in Socks! Horton Hears a Who definitely!! Well reading Green Eggs and Ham is also an all time fav as well!! The Foot Book is great! I always liked the Grinch Stole Christmas. Thanks for the chance, sweetascandy579 at yahoo dot com. I can do that! games are awesome, I want to get them all. For the kids, of course, ahem. Mr. Brown Can MOOO! Can You?happens to be one of our favorites these days along with the Foot Book and Dr. Seuss's ABC's. Thanks. We LOVE Dr. Seuss in out house! Right now, my little boy's favorites are Horton hears a Who and Green Eggs and Ham. My kid like Hop On Pop and I like Green Eggs & Ham. My daughter is the biggest Cat in the Hat fan ever! She also, at the age of 3 , managered to make Horton Hears a Who her first in theater film! But we read Cat in the Hat at least once a week and I loved it as a child as well! I love to listen to my husband read Fox in Socks to my two boys. It is a difficult book to read and we all just laugh and laugh when he messes up. My daughter just found my love, Green Eggs and Ham. Passing on the Suess love! My favorite book is "Green Eggs and Ham" !I love to read this book over and over again to my 8 grandchildren! Horton Hears A Who! We were so excited when the movie was made. I think it has a great message. My favorite Dr. Seuss book is How The Grinch Stole Christmas. My favorite Dr. Seuss book is THE BUTTER BATTLE BOOK! Green eggs and ham is my favorite. I love to read it to my kids. My favorite Dr. Seuss book was Green Eggs & Ham. My favorite and my kids' favorite is Are You My Mother? One Fish, Two Fish, Red Fish, Blue Fish and it makes my grandkids smile!!! My favorite because its my daughters favorite is Mr. Moo can do it. Can you? Green Eggs and Ham - I think I can still recite the whole thing. Right now, on the nightstand is "there's a wocket in my pocket" We love Dr Seuss!! To Think That I saw it ON Mulberry Street is by far my most favorite Dr. Suess book. I even had to memorize it and present it in front of my 7th grade class. I now read it to my little girl. I like the Horton game and I think my girls would, too. Thanks for offering them up to some lucky winners! I loved Hop on Pop as a kid and still love it today when I read it with my daughter. My favorite book is Hand, Hand, Fingers Thumb. I remember the part of the book that saya "hand,hand, fingers, thumb, this way more monkeys come!. The page had hoards of monkeys! Very funny. I would love to win the either of the games! My favorite is How the Grinch Stole Christmas. The Foot Book is a favorite in our house. Thanks for the opportunity! All of the Seuss books are wonderful. I especially love "Oh the Places You'll Go". Beautifully written. I love "Are you my mother?" Without a doubt, it's Green Eggs and Ham. I would have to say "Green Eggs and Ham"! My son really enjoys "Green Eggs And Ham". Both games look like lots of fun, thanks for an opp to win one! Green Eggs & Ham was always my favorite & my grandaughters never seem to get tired of hearing it. My favorite is the Cat in the Hat. My children love Go Dog Go. I think Green Eggs & Ham was my personal favorite. Thanks for the chance to win. This is actually a bit difficult for me. The one I remember most is Hop on Pop, and I still love that one so much. However, my little 2 year old just adores "Are you my momma?" and reading to her brings so much joy to my life! We have four children that I homeschool, and we love all the Dr. Suess books! We've never tried these games...we live in the country and don't have many stores within driving distance (I actually have never seen them before)but they look like they would be a lot of fun and a great learning opportunity. Thank you so much for such a generous giveaway! My favorite is How the Grinch Stole Xmas. how the grinch stole christmas is my favorite book!! My favorite is and always will be The Cat in the Hat! Green Eggs and Ham is a favorite! The Cat in The Hat has always been my favorite! Thanks! I like Horton Hears a Who and The Foot Book. My kids never get tired of reading them over, and over, and over--actually us reading to them! cat in the hat was my favorite as a kid. We love Green Eggs & Ham. I loved "Are you my mother?" Horton Hears a Who, a true classic. i always liked the lorax. the cat in the hat, we love cats! I like that one that goes When Tweetle Beatles battle in a tweatle beatle bottle too - the tongue twister one - but I can't recall the name of that one. It was a lot of fun to read though. I love Horton Hatches the Egg, I can recite it from memory and I do maybe the best British Mayzie Bird you've ever heard. Also my daughter once said that she'd rather I read that book to her than Daddy (no voices)--I take my little victories. I loved Green Eggs and Ham and a lot of others. Dr. Suess books are my 6 year old daughters favorites. She loves Cat in the Hat and One fish, Two fish, Red fish, Blue fish. My favorite is "Oh the places you will go", however, my daughter love "Green eggs, and ham." Red Fish, Blue Fish because it is so silly. My youngest daughter's name is Samantha and we call her Sam. So Green Eggs and Ham is the favorite at our house. I've read that book so many times that I have it memorized. How the Grinch Stole Christmas! Its always been mine, and now its my kids' favorite! Thanks! Green Eggs and Ham for my kids and now my Grandkids. Cute little book, that we love to read together. Green Eggs and Ham of course! My son and his friends dressed up as Green eggs and Ham for Halloween this year, but my favorite book of all time is: Horton Hatches an Egg, it was combined into the Yurtle the Turtle book. I remember my sisters reading it to me and I still have the tattered 1970's copy on my bookshelf. My children loved the green eggs and ham book the most, but they enjoyed all of them. Those games are cute. Thanks for having the contest! As a child my favorites were green Eggs and Ham as well as The Cat in the Hat. My kids love the same! We also all now love Oh! The Places You'll Go!